BATHWA 9-cube shelving rack is made from high-quality metal, and waterproof non-woven. Stable, eco-friendly and odorless. With a size of 15.8 x 11.7 x 10.9'', it can help organize your books, decoration items, art craft, toys, clothes, etc. Which is perfect for the closet room, kid's room, cubby closet and study room. The bookcase is designed to help you keep things organized and at the same time, it could help you decorate your house with a modern style. Function: Storage books, shoes, clothes, etc. STURDY AND DURABLE: This cube storage bookcase is made from high-quality metal, and waterproof non-woven. Stable, eco-friendly and odorless. This storage cube can satisfy you in the daily organization. STORAGE ABILITY: With a size of 80cm/31.2'' x 28cm/10.9'' x 124cm/48.8'', provides large storage capacity and holds up to 10lbs, satisfying your daily storage needs. 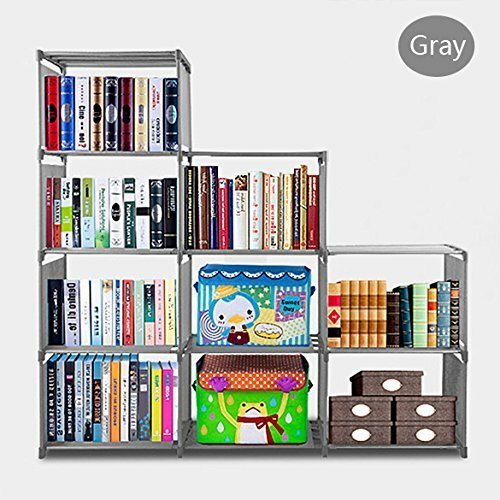 MULTI-PURPOSE: 8-Cube modular DIY storage shelf offers plenty of room for your books, stuffed animals, art craft, toys, and other daily accessories. Perfect for the closet room, kid's room, cubby closet and study room. DIY MODULAR: The modular shape with a simple structure to fit you in a daily organization. You can create storage closet in a variety of shapes to fit your personal taste. EASY TO ASSEMBLE: The bookcase closet can easy installation, no tools required, and be repeated disassembly use, eco-friendly PP material, can be cleaned with water directly. Adjustable cube to fit in the limited space of your office or bedroom. If you have any questions about this product by BATHWA, contact us by completing and submitting the form below. If you are looking for a specif part number, please include it with your message.